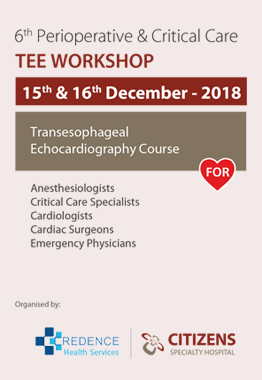 After organizing five workshops successfully we have the pleasure of bringing you the Sixth Perioperative & Critical Care TEE Workshop. The vision of this workshop remains imparting of knowledge and skills. Net Bank Transfer “Cyberabad Citizens Health Services Pvt. SBI Bank, Industrial Finance Branch, Hyderabad. Citizens Specialty Hospital, Nallagandla, Hyderabad – 19.